When was the last time you got a good smell of a Crayola Crayon? It really doesn’t matter the color! Just the scent will turn on the imaginative juices possibly lost since Kindergarten! Or perhaps you remember the hours you spent with Tinker Toys. An adventure filled with a constant flow of unchecked time building, tweaking, and tinkering! Then there was the Easy Bake Oven. A true childhood dream of combining, remixing, and creating. The brilliant inventors at MIT’s Life long Kindergarten Group have found a way to repackage, reinvent, and integrate these same concepts and come up with an ingenious package calledScratch. It is a mix of on-line experiences, computer programing, animation, game creation, multimedia, fine arts, science, social studies, language arts, math, and collaboration. 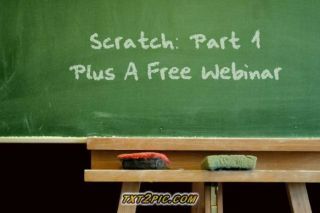 Join me in thisScratch Webinarto discover why Scratch is a must for every 21st Century classroom! Do you want to build a game? Scratch can do it. Do you want to create a work of art. Count on Scratch to allow you to fit together the Master Pieces! Do you want to discover mathematics? You can count on Scratch to make sense out of numbers and number theory. Do you want to tell a story? Scratch can do that with pictures, sounds, and movement! Do you wish to experience sound and music? Scratch will carry quite a tune! There is simplicity for elementary, challenges for middle school, and complexity for the older students. Educators can help students Scratch their way through any level and curriculum. Perhaps your school is fascinated by STEM, or intent on pulling in the fine arts by creating STEAM! Possibly your classroom is venturing into the world of Project and Problem Based Learning. It may be the 21st Century Skills that you are building with students each day. Scratch can be used as a tool to promote all of these awesome avenues that promote student centered high level learning! You will discover how to get students a basic beginning and later get them involved in animation, drawing, interactive art, games, math, music, simulations, and even a possible contest. You will view student creations while listening to their experiences. Most of all this webinar will introduce you to a vast amount of resources and ideas to send you and your students on a quest that will allow them to imagine, program, and share! I will even show you ways to bring Scratch outside of the computer’s environment allowing interaction in awesome, inspiring, and relevant ways! While this webinar will only “Scratch” the surface, it will provide the foundation to incorporate Scratch into your curriculum and get students excited about STEM education and opportunities.